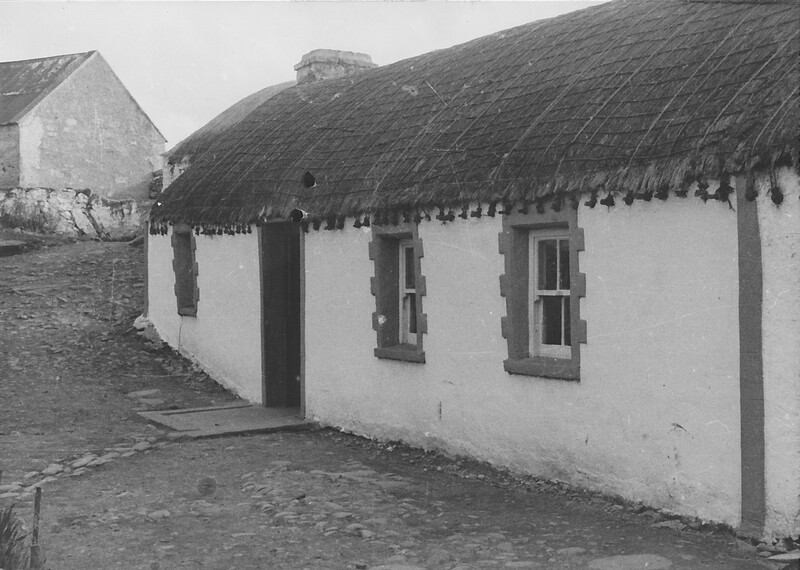 This is Patrick McSheffrey’s cottage in Ballyharry in 1950. He had the nickname “Jaffas” which had some connection with oranges. He was a small farmer who had migrated to America and returned home. The cottage is in Cruckameal which is a subdivision of Ballyharry. It is a perfect clachan and is still occupied by the same families. Some holiday homes have been built. All clachan inhabitants had access to the shoreline and a look at an OS map will show each landholder with a long narrow slice of land which gave him personal access to the water at high tide. This was invaluable for harvesting seaweed either for fertiliser or for sale as kelp. Kelp is dried seaweed and was exported to Scotland for iodine which was essential for infection control in hospitals. Landholders got £5 per ton and the kelp often represented ten per cent of the family income. The sea also provided seafood. Tremone sand had a high lime content so it was used on land. It was also used for building.